On-ear headphones are a great option for listening to music. They sit on your ear rather than surrounding it like over-the- ear headphones, and can be more comfortable than earbuds. There are a variety of styles with great features and outstanding sound, so you're sure to be able to find a pair that meets your needs. As LoveToKnow's technology editor, I received several styles to test and am excited to share the results with you. If you're looking for a pair of compact headphones with great sound that's also easy to keep clean (or at least get clean), look no further than the Humlan model from Urban Ears. Featuring removable ear pad and headband covers that can be laundered in your washing machine, this unique product is, according to Urban Ears, "the world's first headphone with washable parts." These headphones are included on T3.com's list of the best over ear headphones for 2014 due to their sound quality, attractive appearance and unique washable features. The product is also rated highly for these features on TechBargains.com, though the reviewer expresses a bit of concern about what she describes as a tight fit. While I do find the fit snug, it is comfortable to me and works well for outdoor activities where a looser fit could result in unwanted slipping. I find the sound quality to be strong, clear and balanced without too much bass. I often wear headphones while exercising outdoors and during camping trips, so I love the idea of washable covers. It's great to know that even if my headphones get sweaty or dirty, they can easily be washed for future use. These headphones have become my go-to choice for outdoor activities. They do such a good job of meeting the needs of outdoor enthusiasts that outfitters like Backcountry.com and REI carry them, in addition to the types of stores that usually sell headphones. In addition to the outdoor stores listed above, you can also purchase directly from Urban Ears for around $50. Part of Phiaton's Moderna Series, the Fusion MS 430 headphones offer outstanding sound quality in an elegant, compact package that is as sturdy as it is attractive. On AndroidPolice.com, these headphones are described as ideal for those who are "more concerned with what sounds good and is practical over what's popular." CNET describes the sound clarity as 'uberclear,' a sentiment echoed on 148Apps.com, where they are described as having "sharp sound but very clear." Both sites point out that these are not bass-heavy headphones, something that I noticed (and liked) when using them myself. As a frequent traveler, I find these headphones to be ideal due to their sturdiness, relatively compact size and the fact that the ear cups easily fold inside the adjustable headband. I also like the fact that they don't emphasize bass as much as some other models, as I listen to many different kinds of music. Purchase from Newegg.com for around $82. 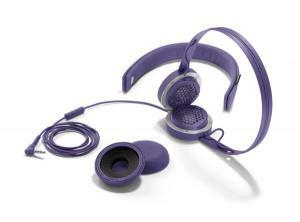 Designed by rapper Nick Cannon, Monster's NCredible headphones have a trendy look that comes in a wide variety of colors. According to the gadgeteer, these compact headphones are "designed for the listener who prefers a stylish look and a bass-y sound." TechCentral describes these headphones as well-suited for members of the youth market who like bass-heavy music like hip hop, electronic dance music and some pop songs, but points out they won't likely be "headphones of choice for audio professionals or fans of anything softer." I like the feel of these headphones, and find that the sound is outstanding with bass-heavy music. I asked a few people who do favor music with a lot of bass to test them, and they reported being highly impressed with the sound. They seem very well-suited for teens and tweens who will enjoy being able to select from a number of colors to personalize their look. Order from Newegg for around $140. If you don't like the feel of having a headband sitting on top of your head, you may find Kinivio's Bluetooth Stereo Headphones to be a good alternative. The band on these compact headphones fits loosely behind your head, hooking over your ears for stability. While I generally find headphones with headbands to be comfortable, it is not uncommon for people to report discomfort with this style as well as with ear buds, so I can definitely see the appeal of having a pair that wraps behind your head. I expected these to feel unstable, but was pleased to learn that the ear cups stay in place well when the band is hooked over the top of the ears. I don't think I'd feel comfortable working out wearing this style, but they feel good for use around the house or office and the sound is good. A review on Techunboxed describes them as "comfortable, easy to use and inexpensive." The reviewer posted an update after 18 months of use indicating that they have held up very well, stating that "they work every bit as well as they did the day I bought them." Buy from Newegg for just under $25. Touted as "pajamas for your ears," SleepPhones are designed for people who like to fall asleep to music or other sounds, but prefer not to try to sleep wearing headband style headphones or ear buds. This product features Bluetooth speakers embedded inside a soft, stretchy fleece headband that wraps around your head and sits flat. The speakers are so small that you don't feel like you're wearing anything other than a headband, so this device is surprisingly comfortable. There is a Velcro closure on the headband that you use to access the charging port, and you can nudge the speakers easily so that they are positioned over your ears. A review on Sound & Vision indicates that the sound quality is good, stating "for the price and intended use, they're surprisingly good." SleepPhones work very well for listening to music or audio books in bed, and are ideal for people who like to fall asleep to comforting sounds or meditation recordings. A review on the AmyLovesSleep blog indicates that they provide a great way for people who find music to be relaxing to unwind at bedtime, and that they also do a good job of drowning out noise. They're also a good option for keeping your bedtime listening preferences from disturbing your sleeping partner. Order the complete system (including a headband and speakers) directly from SleepPhones for around $100. A wired set (as opposed to the Bluetooth version) is available for around $40, though as a review on Tom's Hardware points out, the cord is a possible choking hazard for people who toss and turn in their sleep. Brought to market by the same company that makes SleepPhones, RunPhones are designed with the interests of runners in mind, as well as those who enjoy walking, cycling and other outdoor activities. With RunPhones, thin speakers are embedded inside a stretchy, absorbent headband that wraps around your head, sitting without sliding around while you move. As with SleepPhones, it's simple to access the speakers via an opening in the headband, and you can easily tweak speaker placement inside the band so they are positioned exactly over your ears. Since many runners wear headbands to absorb sweat and keep their hair back, this device serves a useful purpose beyond providing music. These headphones are designed specifically to allow outdoor enthusiasts to enjoy music while still being able to hear outside noises for purposes of safety. This is an ideal option for casual or competitive athletes who like to listen to music but who prefer to avoid the feel of ear buds and headband-style headphones. A review on the Joyful Runner Girl blog describes RunPhones as being so comfortable that she forgot she was wearing them. She also mentioned that the sound quality is good and she liked the fact that she could still hear outside noises while wearing them. Order directly from RunPhones for around $40. Kids are becoming tech-savvy at younger and younger ages, often listening to music, stories and movies on tablets and other mobile devices. It's only natural that youngsters might enjoy right-sized headphones designed with their needs in mind, and that's exactly what Sakar's Volume Limiting Headphones provide. A review on Bullock's Buzz indicates that these headphones are just as great for parents as for the children who will get to wear them, pointing out how nerve-wracking it can be when children are using tablets, computers, iPods and other devices that make noise during long road trips. 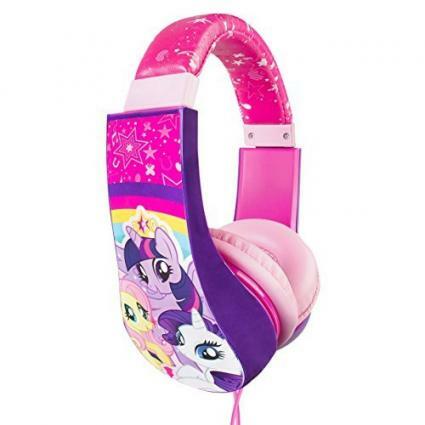 With these headphones, though, kids can enjoy their noise while others in the vehicle can enjoy peace and quiet, yet remain confident that youngsters aren't damaging their ears with noise that's too loud or experiencing discomfort from too-large personal listening devices. A review on MommyPR.com indicates that the sound quality is good and that the volume limiting features are effective. Available in licensed Ninja Turtles, Hello Kitty and My Little Pony designs. Toys R Us carries these in a number of styles, including My Little Pony and Teenage Mutant Ninja Turtles. Each design is priced under $20. These are just a few representative options for headphones that fit on the ear - there are many additional options on the market. Each has different features and a different feel. For the best results, try on a few styles before making your purchase decision. Note: I received free review items for the products discussed in this article. The opinions presented here are my own.